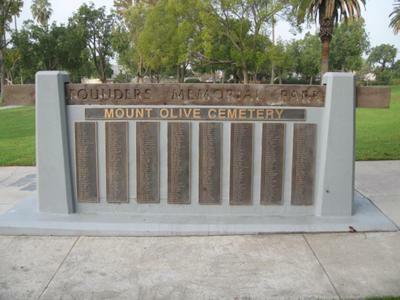 The Mt Olive cemetery is no longer known by that name but is now part of Founders Memorial Park located between 12100 and 12500 Broadway St Whittier, CA. Citrus Ave divides the park which was opened in 1977. The cemetery was covered with fill dirt and leveled. 365 burials took place here between 1888 and 1957. Most burials were from 1900 to 1937. The Whittier Parks Dept contacted over 2000 next-of-kin regarding this cemetery and the Broadway cemetery just across Citrus St.
​Click here for more information about Mt. Olive Cemetery at Find A Grave. Once you are there, you can enter a name in the search engine, or click on View all interments to see all of the graves that are listed for the cemetery.